This glowing guy is happy towering over toys, not T-Rexes. The spinosaurus may have been one of the largest known dinos, clocking in at more than 40 feet long, but this guy is happy towering over toys, not T-Rexes. 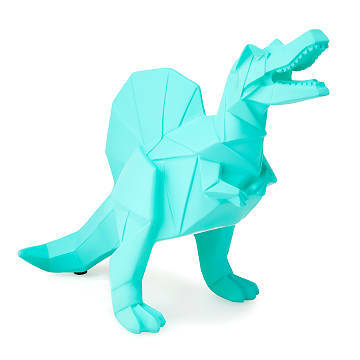 Mint green with an origami-style design, he'll become your kid's favorite bedside buddy, illuminating a good read on paleontology or some prehistoric playtime. Made in China. Super cute! Would have been perfect except the website seems to picture it as a plug-in item; there was no mention anywhere of it requiring batteries. Customer service was great and easy to work with. A second item was sent wry quickly and it still required batteries. In the end the item was returned. True shame that there is no plug in option for those looking to use the item throughout the night. I bought this for my son, who adores dinosaurs. I looked at a lot of dinosaur nightlights and this one was my favorite for beautiful looks and design--it really does look like a work of art. When I went to plug it in on Christmas night, I accidentally pulled it off the nightstand and it fell and broke on the floor. My little boy cried and cried. We fixed it with superglue and all is well again, but I wish it were a bit more durable for an object in a child's room. And if I were getting really picky, I'd want it to have a timer. It's way too bright to be left on all night (calling it a nightlight is misleading...it's a lamp), so I have to go in every night after he's asleep and switch it off. But again, it's just beautiful and it made a sweet four-year-old very happy!